During baptism a person receives a name in honor of a saint, who from that time becomes his heavenly protector. Every Orthodox Christian should be acquainted with the life of his heavenly protector and should appeal to him in prayer for help and guidance. Our righteous ancestors always tried to mark the day of commemoration of their saint – their “Namesday” – by partaking of the Holy Mysteries, and celebrated this day with greater ceremony than their birthday. What is the reason for the Orthodox veneration of God’s saints? Do the saints in heaven know of our needs and difficulties, and do they show any interest in us? Do they hear our prayers and do they try to help us? Should we appeal to the saints for help at all, or does it suffice to pray only to God? Members of sects, who have lost the apostolic tradition, do not understand the essence and the purpose of Christ’s Church and, therefore, reject the need to pray to the saints in heaven. We will briefly expound the Orthodox teaching on the subject. The Orthodox veneration of God’s saints stems from the belief that all of us, both those who are working on their salvation and those who have already achieved salvation, both the living and the reposed, make up a single divine family. The Church is a great society which encompasses both the visible and invisible worlds. It is a huge, universal organization, built on the principal of love, in which each individual must not only take care of himself, but also be concerned with the benefit and salvation of other people. The saints are those people who, more than others, showed love for their neighbors during their life on earth. We, Orthodox Christians, believe that when a righteous person dies, he does not break off his tie with the Church, but enters its higher, celestial domain – enters the triumphant Church. Having attained the spiritual world, the soul of a righteous person does not cease to think, desire, feel. On the contrary, these qualities of the soul unfold here more fully and perfectly. Contemporary non-Orthodox Christians, having lost their living tie with the heavenly/earthly Church, have the vaguest and conflicting notions of the other world. Some of them believe that a man’s soul goes to sleep after death and becomes disconnected from everything; others believe that even if a man’s soul continues its activity after death, it no longer has any interest in the world which it has left. Still others believe that one should not pray to the saints in principle, since Christians are in direct communion with God. What is the teaching of the Holy Scriptures in regard to the righteous ones who have departed from this world and the power of their prayers? In apostolic times the Church was regarded as a single heavenly/earthly spiritual family. Apostle Paul wrote to newly-converted Christians: “But ye are come unto mount Sinai, and unto the city of the living God, the heavenly Jerusalem, and to an innumerable company of angels, to the general assembly and church of the first-born, which are written in heaven, and to God the Judge of all, and to the spirits of just men made perfect” (Hebrews 12:22-23). In other words, you, having become Christian, have merged with a great family and have come into close contact with the heavenly family and the righteous ones therein. Apostle Peter’s words of farewell to the Christians of Asia Minor – “Moreover I will endeavour that ye may be able after my decease to have these things always in remembrance” (2 Peter 1:15) – clearly confirm that he promises to continue to take care of them when he departs for the other, spiritual world. The ancient practice of appealing to the holy martyrs and saints for help is based on the realization of live contact between the heavenly and the earthly Church and on belief in the power of their prayers. We know that the most earnest and righteous people were still in their lifetime called by God His friends and were glorified by Him with gifts of the Holy Spirit and with miracles. Thus, Christ said to His apostles at the Mystic Supper: “Ye are My friends!… For whosoever shall do the will of My Father Who is in heaven, the same is My brother, and sister, and mother” (John 15:14; Matt. 12:50). The Holy Scriptures provide many examples of the saints’ spiritual nearness to God and power of intercession before Him. Thus, for example, Abraham asked God to have mercy upon the denizens of Sodom and Gomorrah, and God was ready to fulfill his request if at least ten righteous people could be found in those cities. Another time God refrained from punishing Abimelech, king of Gerar, because of Abraham’s prayers for the latter. The Bible tells us that God spoke with the Prophet Moses face to face, “as a man converses with his friend.” When Miriam, Moses’ sister, sinned and was punished with leprosy, Moses was able to obtain forgiveness for her from the Lord. There are many other examples of the special power of the saints’ prayers. The saints do not replace God and do not decrease the need to appeal to the Heavenly Father. After all, adult members in a family do not lessen the authority of the parents when they take care of their children together with them. Moreover, nothing gives greater joy to parents than to see older brothers taking care of younger ones. In the same manner our Heavenly Father rejoices when the saints pray for us and try to help us. God’s saints have a stronger faith than we do and are closer to God because of their righteousness. Therefore, let us appeal to them as to our older brothers who intercede for us before the throne of the Almighty. It is noteworthy that the righteous ones, while still living on earth, saw and knew much of what is inaccessible to general comprehension. Even more so are these gifts inherent to them in the celestial realm, where they have gone after shedding their mortal flesh. 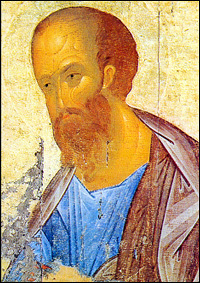 During their life on earth, the saints were able to penetrate into the celestial realm by means of their spirit, and some saw hosts of angels, others were worthy enough to contemplate the image of God, still others were raised up to the third heaven and heard mysterious indescribable words there, as, for example, Apostle Paul. Now, residing in heaven, they are even more capable of knowing what takes place on earth and of hearing those who appeal to them, because the saints in heaven are “equal to angels.” From the Lord’s parable of the rich man and Lazarus we learn that Abraham, while being in heaven, could hear the cry of the rich man suffering in hell, despite the “great abyss” which divided them. Abraham’s words: thy brothers have Moses and the prophets, let them heed them, – clearly show that Abraham knew of the life of the Jewish people after his repose, knew of Moses and his law, of the prophets and their writings. The spiritual vision of the righteous ones’ souls in heaven is, undoubtedly, greater than it was on earth. Apostle Paul writes: “For now we see through a glass, darkly, but then face to face; now I know in part, but then shall I know even as also I am known” (1 Cor. 13:12). The saints’ nearness to the throne of God and the power of their prayers for the faithful living on earth is evident in the book of Revelation, in which Apostle John writes: “And I beheld, and I heard the voice of many angels round about the throne, and the beasts and the elders: and the number of them was ten thousand times ten thousand, and thousands of thousands.” Further on he describes a vision of the righteous ones, praying in heaven for people suffering on earth: “And another angel came and stood at the altar, having a golden censer; and there was given unto him much incense, that he should offer it with the prayers of all saints upon the golden altar which was before the throne. And the smoke of the incense, which came with the prayers of the saints, ascended up before God out of the angel’s hand” (Rev. 5:11; 8:3-4). Great is the power of prayer! “Pray for each other, so that ye may be healed: the earnest prayer of the righteous can do much,” – instructs us Apostle James. Prayer for others is an expression of love for them; thus, by praying for us, the saints in heaven show their brotherly love and care for us. In the Gospel and in other New Testament books we find numerous instances which testify to the power of prayer for others. Thus, for example, the Lord healed the son of a courtier in response to the latter’s plea; the entreaty of the woman of Canaan resulted in her daughter being freed from possession by demons; at the request of a father the Lord healed his possessed son, while at the request of friends He forgave and healed a man sick of the palsy, whom the friends had lowered down from the roof on ropes; the faith of the Roman centurion led to the healing of his servant. Moreover, the Lord performed the majority of His miracles from afar, without actually seeing the sick person. Thus, if the prayers of plain people had such power, then even more powerful are the prayers of saints who stand before the throne of God. “And this is the confidence that we have in Him, that, if we ask any thing according to His will, He heareth us,” – assures us Christ’s beloved disciple (1 John 5:14). The testimonies of the Church Fathers and teachers on the Church’s veneration of the saints are numerous, especially starting with the 4th century. But even from the beginning of the 2nd century there is direct written testimony of early Christians on their faith in the prayers of saints in heaven for their brothers on earth. Witnesses of the martyric end of St. Ignatius the God-bearer (early 2nd century) say: “Returning home in tears, we served an all-night vigil… Afterwards, having slept a bit, some of us saw the blessed Ignatius arising and embracing us, while others also saw him praying for us.” Similar records referring to the martyrs’ prayers and intercession for us can also be found in other narratives dating from this epoch of the persecution of Christians. Belief in the holiness of a departed person can be confirmed by special testimonials, such as: martyrdom for Christ, a fearless confession of one’s faith, selfless service to the Church, the gift of healing, etc. This is especially true when the Lord affirms the holiness of a departed person through miracles occurring after the latter’s death and upon prayer to him. Besides the assistance of prayer, the saints help us achieve salvation by the example of their lives. An acquaintance with the lives of the saints enriches a Christian through the spiritual experience of those who had embodied the Gospel in their lives more earnestly than others. We see here so many vivid examples of living faith, courage, patience. Being people just like us, and having overcome most difficult temptations, they encourage us to travel along the path of our life with patience and humility. Apostle James urged Christians to imitate the patience of the ancient prophets and of Job the Long-suffering, and to acquire the strong faith of people like the prophet Elias. Apostle Peter instructed Christian wives to take an example of modesty and obedience from the righteous Sarah, wife of Abraham. The holy Apostle Paul exhorts Christians to imitate the spiritual labors of ancient saints, beginning with Abel and ending with the Maccabees. At the end of a detailed instruction on this subject he writes: “Wherefore seeing we also are compassed about with so great a cloud of witnesses, let us lay aside every weight, and the sin which doth so easily beset us, and let us run with patience the race that is set before us” (Heb. 12:1). The Lord says: “Neither do men light a candle, and put it under a bushel, but on a candlestick; and it giveth light unto all that are in the house. Let your light so shine before men, that they may see your good works, and glorify your Father which is in heaven” (Matt. 5:15-16). The saints are the bright stars which show us the way to the Heavenly Realm. Let us treasure the saints’ nearness to God and let us appeal to them for help, bearing in mind that they love us and are concerned for our salvation. An acquaintance with the lives of the saints is especially important in our times, when the concept of the Christian ideal has become so shallow and distorted among the wide mass of “Christians” of the most different varieties.